WWF Sweden is urging its government – holding the current EU Presidency - to get behind an effective international agreement on halting forest loss as a key and highly cost effective measure on climate change. A new report shows combatting deforestation to be second only to energy efficiency as a way of combatting climate change. Stockholm, Sweden - WWF Sweden is urging its government – holding the current EU Presidency - to get behind an effective international agreement on halting forest loss as a key and highly cost effective measure on climate change. Gold in Green Forests, a report issued today by WWF-Sweden, says that next to energy efficiency halting forest loss and degradation is the most cost-effective method for mitigating climate change. The annual loss of natural forests in developing countries is equivalent to one third of Sweden’s surface area. Forest fires, the conversion of forests to agricultural land and the cultivation of energy crops are responsible for the high rate of forest loss. A program to reduce greenhouse gas emissions from deforestation, known as REDD (Reducing Emissions from Deforestation and Forest Degradation) is currently being discussed in the negotiations for a global climate deal. REDD aims to make it worthwhile for developing countries to maintain their forests, as opposed to cutting them down.
" solutions can be good for both the environment and our wallets"
In Indonesia, where large areas of forests are cut down and prepared for palm oil plantations, 80 percent of greenhouse gas emissions come from deforestation. Halting deforestation would not only reduce greenhouse gas emissions, but would also secure the livelihoods of people living in these forests. ”We should see that many solutions for climate change are good for both the environment and our wallets. - Sweden’s cautious attitude in this area is therefore very surprising,” said Gustavsson, who calls for the government to take action during the ongoing climate change conference in Bangkok and secure a system to finance the protection of the world’s forests. 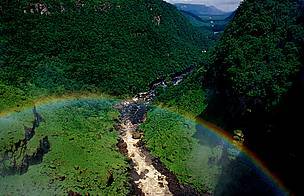 ”Norway, Finland, Denmark and Germany have already guaranteed financing for REDD between 2010 and 2012. It's time for the Swedish government to take action - both domestic and as EU President,” he said. If parties are able to come to an agreement on a new climate deal in Copenhagen, it will not enter into force until 2013. Meanwhile deforestation will continue to accelerate in large parts of the tropics. “Time is passing and the possibility of reaping the positive climate effects that a stop in the loss of forests entails is decreasing rapidly. Complex social, economic and ecological are involved which is why a global cooperation for REDD must be carefully prepared,” says Stefan Henningsson, Climate Director, WWF Sweden. WWF negotiators in Bangkok are urging a an insitutional structure for REDD which guarantees transparency, effectiveness and longterm financing from developed countries in support of measures in developing countries. In financing, WWF is seeking the equivalent of $US 42 billion per year after 2013, a key element of an estimated financing requirement of $US 160 billion annually for climate change adaptation and mitigation in developing countries. The scheme would aim for a goal of zero net deforestation by 2020, with WWF also emphasising that forestry and climate projects must also contribute to the conservation of biological diversity and respect the rights of local and native populations. WWF Sweden is urging its government to get behind an effective international agreement on halting forest loss.